Just two hours north of Toronto, you can and will find your quintessential Canadian winter experience in Explorer's Edge. Everything you've ever wanted out of winter is right in our own backyard and we wanted to see what all the fuss was about. Known as Explorers' Edge, this region of Ontario encompasses Algonquin Park, the Almaguin Highlands, Muskoka, and Parry Sound on Georgian Bay. Explorers’ Edge is one of the province’s most popular travel destinations. You all know it as a summer hot spot filled with luxury cottages, but it's open for business in the winter too! And boy what a winter experience it is. We checked in to beautiful Cedar Grove Lodge and instantly felt at home. It's one of those places that captures exactly what a winter getaway should be. 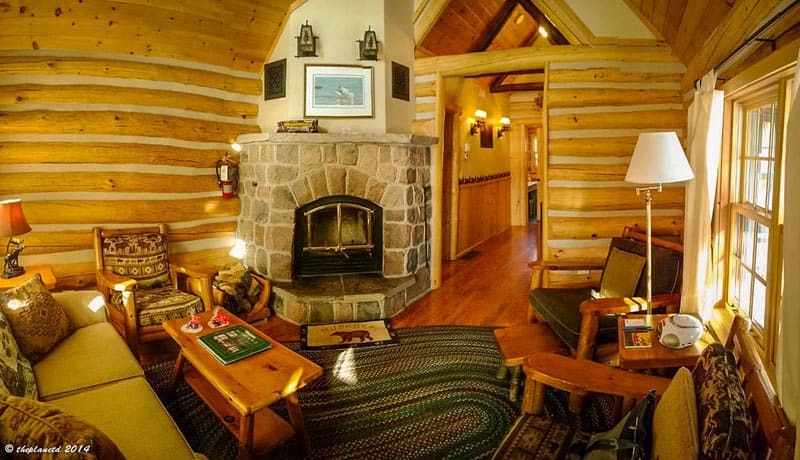 With a wood burning stone fireplace in our private cottage on the lake, the setting was picture perfect. If we wanted to cozy up here all day and never leave we could. The resort has an ice rink cleared with hockey nets set up on the frozen lake. 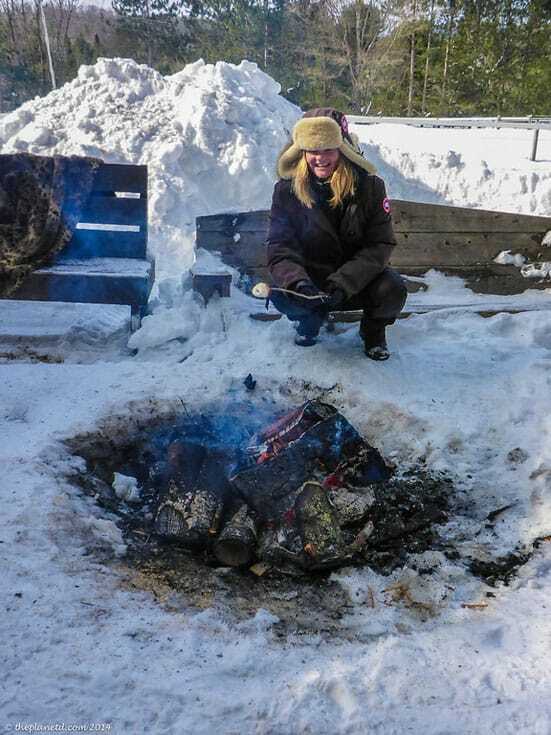 There's snowmobiling, snowshoeing, and even a romantic spot by the outdoor fireplace set up with Muskoka chairs just waiting for you to enjoy a hot chocolate. 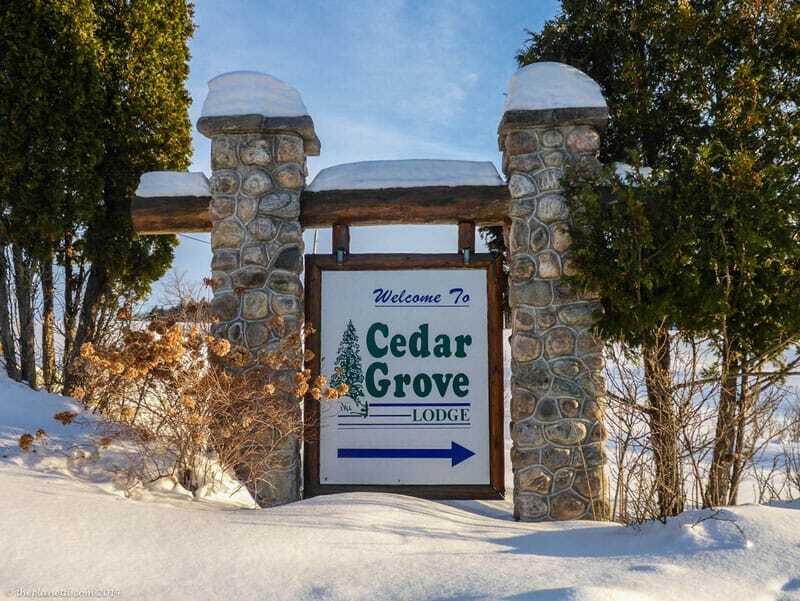 Cedar Grove serves three square meals a day and the main lodge has board games, big screen TV and a fireplace to keep you occupied and warm. You may never want to leave! We were tempted to stay in the cottage and sip wine by the fire, but with so much to do, we had to get out and explore the best of the area. 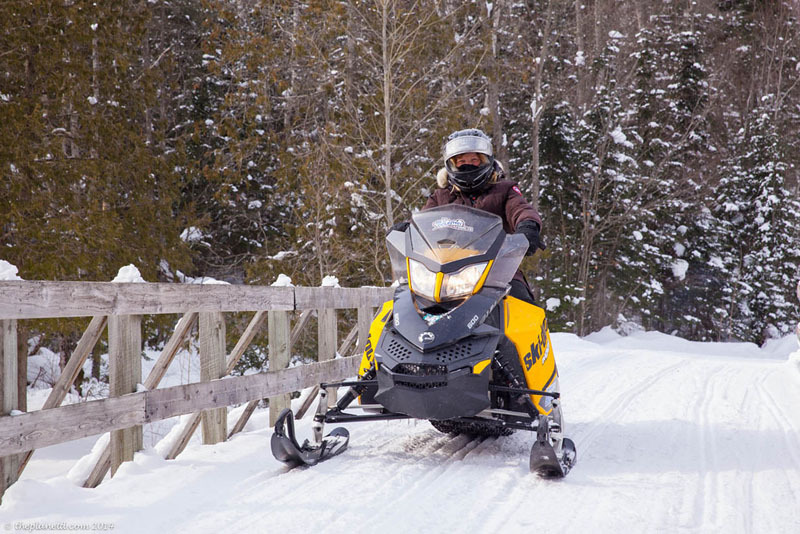 A Canadian Winter Wilderness experience wouldn't be complete without hitting the trails on the snowmobile. We met up with Back Country Tours in Dwight first thing in the morning to get suited up for our trip. Luckily we're winter wear prepared with all our Canada Goose attire, but if you don't have warm clothing, Back Country Tours has warm coats and ski pants for you to borrow. There was a group visiting from the States while we were there and they were all trying on the assortment of winter coats. Once we signed our waivers and fitted our helmets, we followed our guide Kim out to the sleds for a quick refresher lesson. Dave and I hadn't driven snowmobiles since we were teenagers up until last year when we first tackled the backcountry in Whistler and since that time, we've managed to get out on the trails a few more times, so we felt confident and ready for a fun day in the snow. Snowmobiling is a spectacular way to explore the backcountry. While we love snowshoeing, cross-country skiing, and hiking, it's amazing to be able to get from place to place quickly. 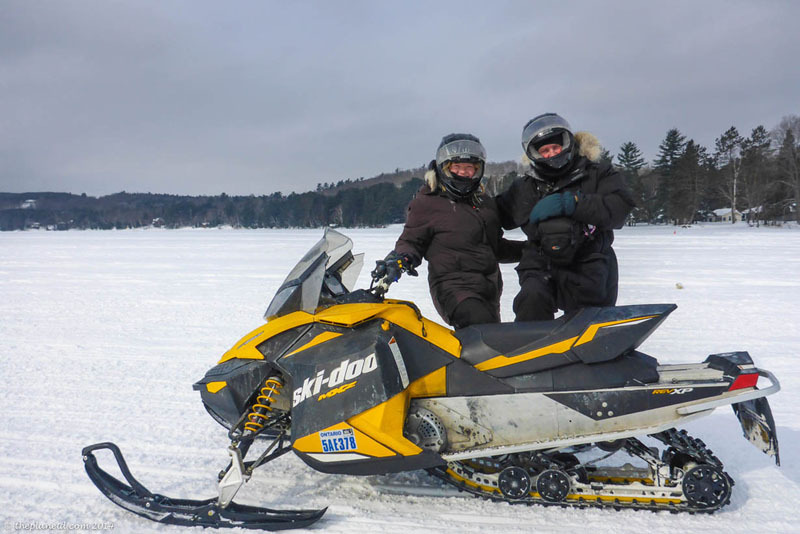 Snowmobiling is a hugely popular activity in Canada and many people take extended tours where they sled from hut to hut and resort to resort. Our trip was only taking us on a half day tour, but it was enough to really get a sense of what a day of adventure would be like. We saw tonnes of animal tracks on the trail and we even saw a couple of deer in the woods. If only the other snowmobilers would have slowed down as they passed, the deer would have stuck around a bit. Alas, they bounded off as soon as another group approached. The trails were fun and it was beautiful to drive through the magical forest. 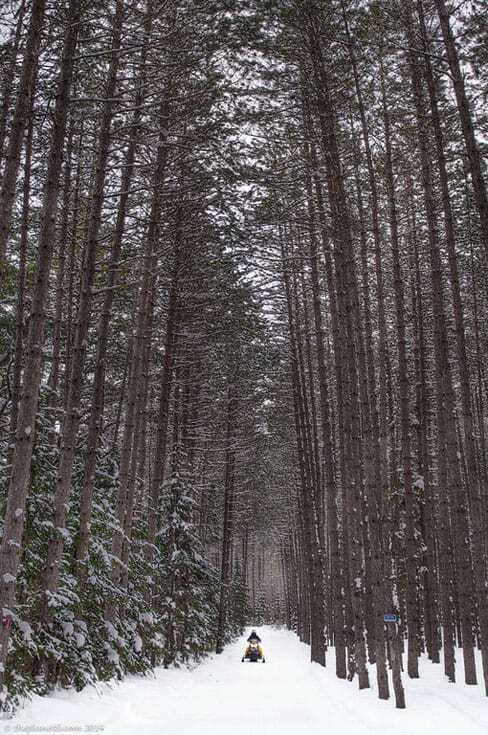 (as Kim called it) At one point I was riding through the narrow trail as giant chunks of snow fell off the trees. It was truly a ‘Lion, The Witch and the Wardrobe' moment. While the trails were fun, it was the racing on the frozen lake that really got the blood pumping. Kim raced out ahead of us and motioned us to catch up and weave between each other. It was so exhilarating to really let her rip. A few weeks ago, you'd never get me snowmobiling on a lake, now I can't get enough of it! That's what a season of playing in the snow will do to a person. It's makes you fearless! If you are looking for something with a little less speed, you can still have an outdoor adventure by taking a romantic sleigh ride. 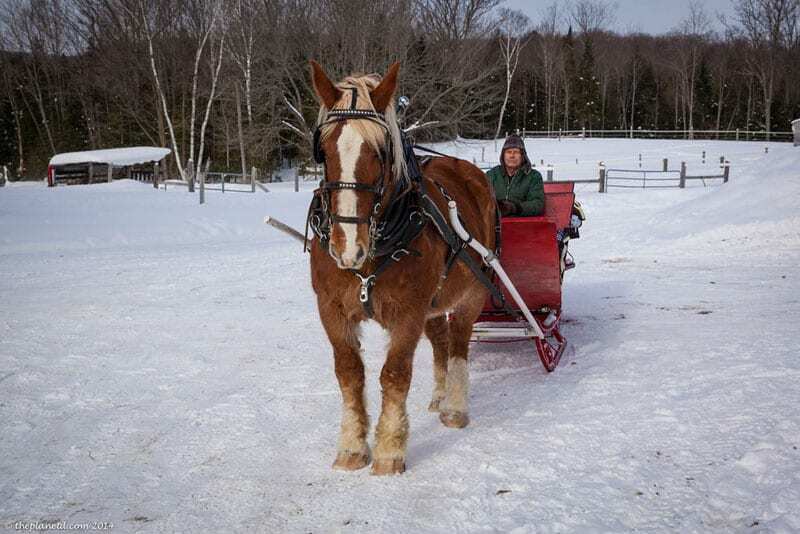 What says happy winter more than a horse-drawn sleigh ride through the forest? 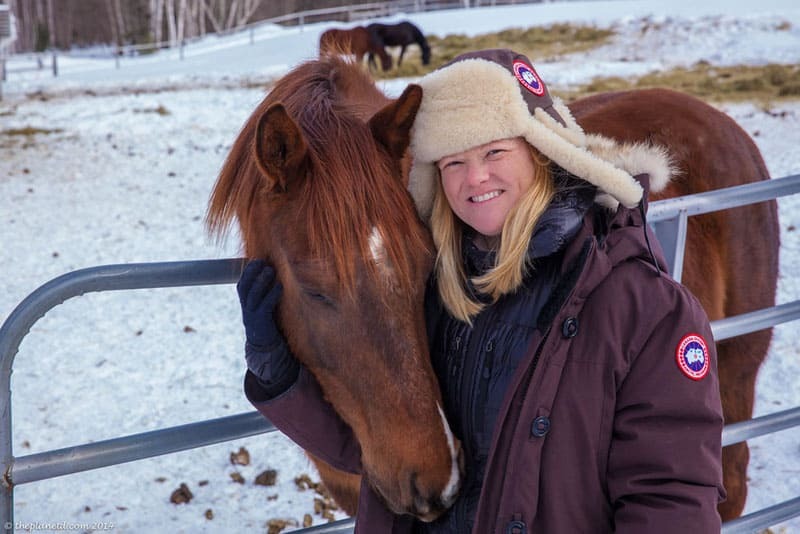 Visiting the Back and Beyond Equine Centre near Huntsville isn't just a sleigh riding experience though, you also learn about horses. We took a walk through the stables and learned about how horses live and work together. Humans can learn a lot from horses and how they act. Back and Beyond is actually beginning to start running corporate retreats to help people establish their place in the work world. An interesting fact we learned was that for a horse to be the leader of the pack, they don't necessarily need to be the largest or the strongest, just the most confident. Owner/Operator Kathy tells us that the ruler of the stables is actually the smallest horse of the bunch! That gives me hope at 5'4″. The stables house about 18 horses with even more deer hanging around. The deer have called the stables home and even jump into the corals with the horses to chill out and graze. The horses seemed to have adopted them as siblings, because they don't seem to mind the intrusion at all. After a stroll through the property, our horse Major was all warmed up and ready to go. We hopped on board the sleigh and covered up in cozy blankets to began the ride through the trails. The centre is located right in the middle of a beautiful forest and we saw everything from rabbit and fox tracks to wolf and deer tracks. Visiting Northern Ontario in the winter give you a glimpse into the wildlife world better than the summer months. You can go without seeing a thing in the summer, but in the winter, there are hints of wildlife everywhere. You can see their tracks all over the snow, and with the leaves missing from the trees, you have a better chance of spotting them too. We circled around for about an hour before settling in at a campfire where treats, hot chocolate, and hot apple cider were waiting for us. They even had marshmallows ready to roast. We said goodbye Major as he darted off to the barn to warm up under his own cozy blanket while we enjoyed warming up by the fire. It truly was the perfect day with Kathy and Bill offering down-home hospitality. You can tell they have a great passion for what they do. As we discussed the magic of a true old-fashioned winter, we realized that people outside the city are happy in the snow. The sun is shining, there's plenty of activity and everyone is outside enjoying everything that winter has to offer. The world may be calling it the Polar Vortex, but up in the Explorers' Edge it's the perfect escape. This is what winters' used to be like. We were taken back to our childhood where snow piled up over the doors and we made snow forts in giant snowbanks. Winter is back baby, and we're loving it! So instead of feeling blue about the cold days ahead, head out of the city and discover that winter is a wonderful time to be in Ontario. 16 Responses to "Embrace the Cold in Explorer’s Edge Ontario"
That cottage would entice us to stay cozy and warm inside too :-). But you’re right – to live in Canada, we have to embrace the winter. The sleigh ride looks like fun! Exactly! If you don’t embrace the winter here, you are going to end up being miserable. When you get outside and enjoy it, it can really be amazing! Heap of snow with enjoyment burst…Thanks for sharing this post..Its full of fun very, much lively and m very much chilled!!!! Thanks for your enthusiastic comment! It was a lot of fun thanks! Hi Anna, you will have to definitely give winter a try sometime. It’s a neat experience for those who haven’t felt it before. Make sure to dress well though, if you do come here, you’ll want to have the right clothing for sure. We’ve seen people freeze and have a miserable time because they weren’t dressed properly. Thanks for this post! I’m in Vermont and I’m kinda feeling the winter blues, so thanks for the positive take on all this cold and snow. Makes me want to get outside again! Glad to hear Sierra. It’s really true, if you get outside and play in the snow, it’s actually a lot of fun. Afterwards head to a cozy coffee shop for some hot chocolate and enjoy! I could use a bit of snow! I’m having the opposite here in the Philippines on the beaches. I do enjoy snow activities though I must say. So true! Even prolonged heat can get a bit tiresome. As much as we love it 🙂 Like everything in life, it’s good to have a bit of variety. Oh winter! I hope it can rain snow too here in our country. Facepalm. Ha, where are you Kristy? It sounds like it is somewhere hot. Can’t believe how you guys are getting me excited about doing things in the snow. That’s something no one ever accomplished before! That makes me so happy. We feel warm and fuzzy on this cold winter’s day. I hope you get a chance to enjoy the rest of winter wherever you may be.